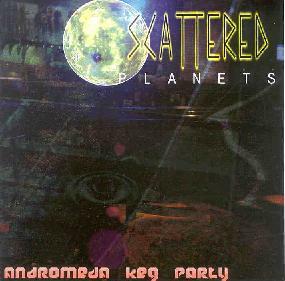 Scattered Planets - "Andromeda Keg Party"
Scattered Planets return with their second set of Space Rock for the new millennium. The first Scattered Planets CD, Drinking With Aliens, was a solo effort from Doug McMahan who performed all the music with synths and efx. Having since relocated to Philadelphia, Doug hooked up with Bob Lennon who Hawkwind aficionados will know as the editor of the HAWK-U.S./Time & Space Fanzine. Now a duo, Bob's guitar and efx pumps some additional aggression to the music, giving a more purely rocking edge to the Space. In fact, the efx bring to mind Greg Kozlowski's work on Architectural Metaphor's Creature Of The Velvet Void album, which should put a hungry smile on your face. The CD is only 27 minutes long but Scattered Planets state their case right in your face in that time. "Das Andere Idyl" opens the set and consists of dark and haunting space rock. I dig the dancey foundation with swirling space synths and drones. "Digital Strangers" is another excellent tune. "Drifter" features very cool grinding guitars and ghostly choral vocals from guest Lynne. "Electric Dreams" is one of my favorites being a totally cosmic efx laden trip. And "Wasteland" is similar but the band stretch out and explore over nearly 9 minutes. Honestly, this sucker is LOADED with tripped out alien efx that embellish the dancey base that is a Scattered Planets trademark. You want totally cosmic heavy Space Rock? Step right this way. For more information you can visit the Scattered Planets web site at: http://www.scatteredplanets.com. Hear songs at the Scattered Planets Mp3.com web site at: http://www.mp3.com/scatteredplanets.